A and C began care with me at 22 weeks along during their second pregnancy. A had been young during her first birth and had a very interventive birth, and desired something differently for this journey. A’s pregnancy progressed beautifully, until the last two weeks when prodromal labor decided to set in. Anyone who has gone through days of prodromal labor knows that it is no fun. On November 30, 39 weeks along, A texted me stating she felt like this could be labor. She was out of the house and decided to stop by for an exam around 630 that evening. She was 4-5cm dilated, 60% effaced and baby was at a -2 station. I swept her membranes and encouraged her to go home and eat a good dinner. They joked about eating pizza, and I told C he could eat pizza, but that A might want to pick something different in case labor made her vomit. She thanked me for that advice later. Contractions really intensified about an hour later. A couple hours later, A called her doulas over. I grabbed a nap, awaiting the birth call. I arrive a little after 1am, finding A sitting, with contractions coming every 3 minutes, lasting 60 seconds. Soon I did a cervical exam and found her to be 5-6cm, 80% effaced and baby at a -1 station. Things were moving along. A sat on the birth ball, rocking her hips, her doulas alternating providing counter pressure. C and I got to work at blowing up the birth pool. After blowing it up and turning off the air pump, we could hear a very audible leak in the pool. C went to work to find the leak and plug it up. A ate some watermelon in between contractions. Contractions spaced a little to every 4 minutes, 50 seconds long. Around 3:40am, A decided she wanted to lay down and see if she can get some rest. I did her vitals and listened to the baby and sent her and C in for a nap. The birth team chatted in the living room quietly, but only a few minuted passed and we began to hear moaning coming from the bed room. It was clear that labor was moving along. A little after 4am, A walked out and said she threw up. Increased bloody show was seen and contractions felt harder. She walked around the living room for a few moments, before deciding to get in a hands and knees position while leaning on the birth ball. Contractions were coming every 3-3.5 minutes, lasting 75 seconds long. We started to finish filling the pool so it was ready for A when she wanted to get in. Close to 5am, A requested an exam. She was now 7-8cm, 100% effaced and baby was low at a +1 station. A decided she wanted to get in the pool! A little after 5am, big brother N woke. He was quite fascinated by the scene, a pool in his dining room and all the people! He made sure his mom knew she was being too loud for him to hear Power Rangers! Several moments through the 5am hour, A mentioned the pressure was increasing, with moments of just wanting to push. She labored leaning over the side of the tub, then moved to her left side to labor. An exam at 6am found her to be 9cm dilated. 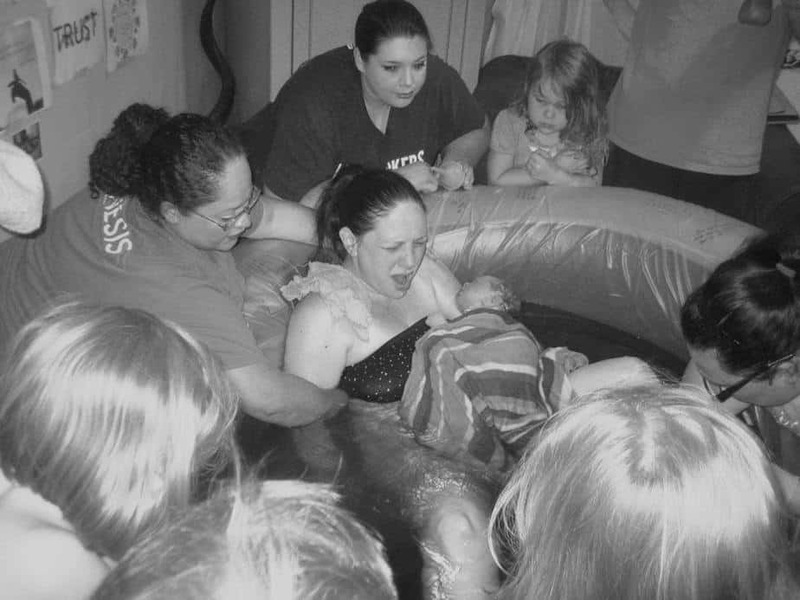 At this moment I had to break the unfortunate news to A that there was no way we could push and have a baby in the birth pool. Her cats had put dozens of holes in the birth pool, making it impossible for us to keep air in the rings for longer than a few minutes. A decided she wanted to move to her bed. The urge to push was strong. Once relaxed on the bed, I did another assessment and found a thick lip of cervix on her left side. I encouraged A to roll over onto her left side and labor for a handful of contractions to help reduce the lip. At 6:40am, A stated she really needed to push. I found her to still have a lip, but now it was much thinner and floppier and seemed to try to reduce on its own during contractions. I told A if the urge was there, she could push, but we would want to reassess in 4-6 contractions to be sure the lip wasn’t swelling from being pushed on. A decided she wanted to move to the toilet. For the next 20 minutes, A labored on the toilet, pushing with contractions. As 7am appeared, A moved back to the bed and let me hold back her lip. After a couple contractions, the lip was gone. She was 10cm, 100% and baby was at a +2 station. Mama was ready to push! And push, push, push A did. Every 10-15 minutes, A would change things up. She felt like she needed to push in a squat so she pushed in a squat next to her bed. Then moved into the bed, leaning back onto C to push. A said she thought she was starting to feel the head. We could see the amniotic sac peeking at the perineum with pushes. Big brother N would come into the bed room off and on to check on the progress and ask us what was taking so long. Probably the funniest thing during this time was him staring between his mom’s legs and asking me why the baby was coming from there because he watched videos with his mom and the baby always comes from the belly button. He made sure to go to every person in the room and inform them of that. He thought we were all doing it quite wrong! At 8am, A moved to the birth stool. She asked me to give her pressure to help guide her pushing, so with each contraction, I would push down to help her push. Baby never seemed to descend any further. After discussion, A decided she wanted me to break her water in hopes it would help baby descend and speed things along. At 8:26am, I broke her water and a normal amount of clear fluid appeared. Baby sounded well. A began pushing again leaning against C in a semi reclined position. One minute before 9am, the head was seen at the perineum. Five minutes later, baby was crowning, followed by the birth a minute later. Sweet baby girl was looped in her cord, so I unlooped her and placed her on her mama’s chest where she let out a cry. Welcome to the world sweet baby Nikki, born earthside on December 1, 2014 at 9:05am, weighing in at 7.4#, 20.25″ long. Mama was amazing through her labor journey. Blessed to get to serve this family. Ending note, can’t not share this picture: I believe this was taken right at delivery. You can see big brother N is covering his ears and informing everyone that things are too loud. This kid was hilarious through his mama’s birth journey.